Boy, pop tarts are everywhere these days, aren’t they? Recipes for homemade pop tarts have been appearing on food blogs for a while now, but once Bon Appétit published theirs this past spring it ignited a bit of a trend. Then, last week, the Pop-Tarts World retail store opened its doors in Times Square. 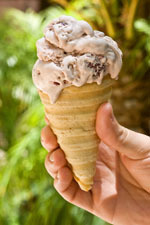 The sweet little breakfast treat we grew up with all of a sudden got huge! Of course, I’m of the belief that almost anything that you toast can be made just as easily – possibly even better – on the panini grill. Pop tarts definitely qualify. 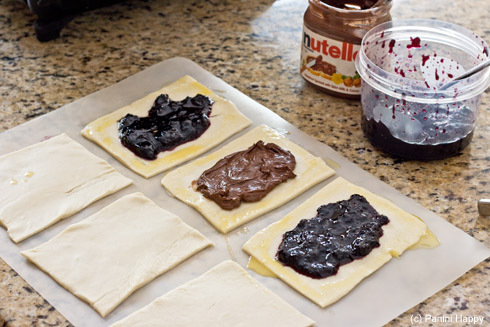 So I cut out some puff pastry rectangles, filled some with homemade blueberry jam and others with chocolate-hazelnut spread (aka, Nutella), sealed them up and put them on the grill. Within about seven minutes I had perfectly puffed, flaky, golden homemade pop tarts…complete with ridges to cradle some tangy lemon glaze. These were incredibly easy to make, with a few sheets of frozen puff pastry and the sweet fillings I had on hand. They’d also be interesting with savory ingredients, like shredded cheese or barbecued pork. Just thinking aloud. There was a small ooze factor with the jam. Try as I might, a little always wanted to escape from inside the tart. Deb from Smitten Kitchen recommends mixing in a little cornstarch to thicken it and minimize the ooze. I actually didn’t mind…it makes it easier to tell which one’s which! After about seven minutes on the grill, breakfast was served! Preheat the panini grill to 400°F. Unfold the puff pastry on a lightly floured surface. Depending on the thickness of your pastry, you may need to roll it out to a 1/8″ thickness. 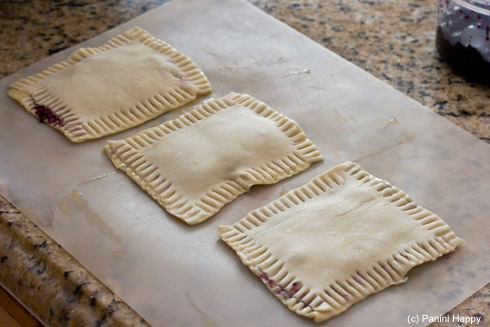 Divide each pastry sheet into 6 equal rectangles (the size is up to you, mine were about 3″x 4″). Spoon 2-3 tablespoons of filling onto six of the rectangles – be careful not to overload them or the filling may be more likely to ooze out during grilling. In a small bowl, beat the egg and water together to make an egg wash. Brush the egg wash around the edges of the rectangles that have filling. Place an “empty” rectangle on top of each of the filled rectangles, press to seal the edges and crimp with a fork. In batches, carefully place the sealed tarts onto the panini grill. Lower the lid until it’s hovering just above (about 1/4″) the tarts without actually touching them. As the tarts bake they’ll puff up and make contact with the upper grate – you want to give them a little room to expand. Grill for 6-7 minutes until the tarts are puffed and golden. 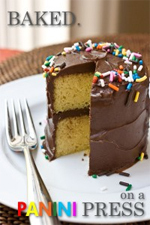 Meanwhile, whisk together the powdered sugar and lemon juice in a small bowl to make the glaze. Drizzle glaze over the grilled pop tarts – serve hot and enjoy! Love this! My son starts school soon and likes the idea of Pop Tarts — though not the real thing. I can’t wait to make these for him (and me too!). I may have to pack the panini press to take on vacation just so I don’t have to wait to try this genius recipe. Thanks Kathy! Get out of here!! This is so awesome! Thanks for sharing, love this!! What a great idea! This would be loads of fun to make with kids. I’ve said it before, but you are so very creative. What a way to kick up homemade pop tarts!! Now if I could just duplicate the cinnamon-brown sugar filling. That’s my favorite flavor. I LOVE poptarts… they’re a guilty pleasure. Love the step by step pictures. You make it look so simple and delicious! Have you added this recipe to Fiddme yet? My grandkids would love these — and they’d especially love the ooze! Thanks for another great panini idea. This looks so yummy. I just love nutella! Thanks for the creative idea! Just for these alone I would get a panini grill. My kids would love this! these are way too elegant to still be called pop tarts! they are gorgeous! 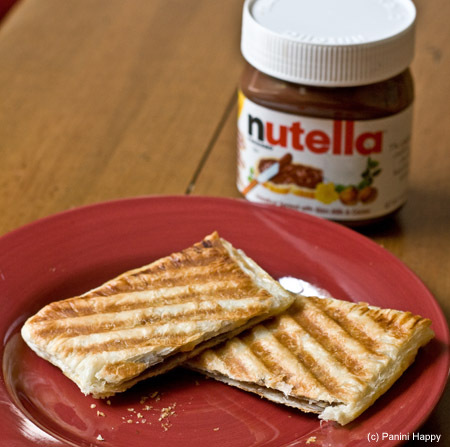 i dont eat gluten or dairy or many other things that i am allergic to but omg bewteen the warm nutella and the panini press…you have me wanting these….bad! nice to “meet” you, glad Marla played matchmaker! 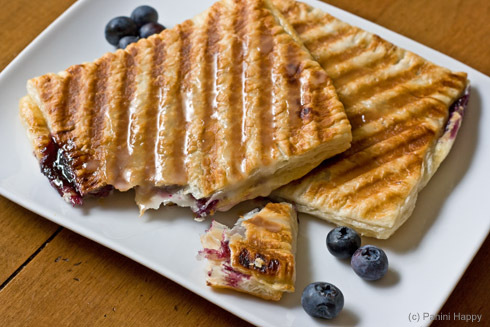 Puff pastry on the panini press is genius! I happen to have some in the freezer and I spied the Nutella in the pantry just today thinking it would be great in a homemade pop-tart! Attempt #2 is coming up this weekend! Thanks for the inspiration! Anything with Nutella is amazing! This looks delish! I love paninis – glad you stopped by my blog so I could find these amazing pop tarts. So easy to make, too! And there’s a Pop Tarts World retail store – crazy! That is a most amazing pop tart! Nice to know there are better alternatives than the overly sweet packaged stuff. We made some of these, but just with the oven. The boring way. 🙂 Great idea to use puff pastry. So flakey. LOVE this idea! I wasn’t a fan of the pop-tarts that are in a box, however the idea of making them with homemade ingredients – love love love! Brilliant! I’m so loving this idea! Thanks for the inspiration. I love that you grilled these! That looks like a really cool idea, and probably much healither than buying Pop Tarts from a supermarket. I love how you make all the pastry yourself instead of just buying it frozen, well done! How creative! These look and sound amazing. I just got a new panini grill and these are on my list to try. Yummy! Hi Kathy – keep forgetting to get over here…I know this post is several months old now, so this comment is more for you than anyone else who might stop by. But I love it when people come back to my blog and tell me they’ve made one of my recipes, so…. I wanna try these with cheese for sure..
Do you think it would work with pie crust instead of puff pastry? I have some on hand that I wanna use up! You know, I haven’t tried pie crust on the grill yet. Definitely let me know if you do! The challenge will be avoiding burning, so a lower temperature might be good. 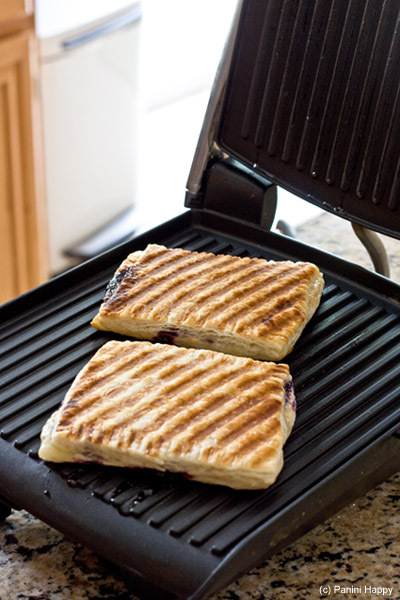 Could I use a George Foremen grill since I don’t have a panini press. Next post: Get Dinner on the Table + Children’s Book Giveaway!